This THP is about 7 miles NE of Orick, CA and about 10 miles SE of Klamath, CA near the eastern boundary of Redwood National Park. Green Diamond Resource Company is planning a mostly clearcut tractor and cable logging operation in redwood, Douglas fir, grand fir, western hemlock and Sitka spruce forests. The THP area flows into the Lower Klamath River watershed which is listed as an impaired watershed for sediment, temperature, dissolved oxygen and nutrients. 134 road drainage sites are planned for work including rocking, dip construction, ditch cleaning, culvert repair/replacement and restoration of washed out crossings. There is an osprey nest within .25 miles of the A600 road, a second osprey nest within .25 miles of the CL1040 road, and a bald eagle nest within .43 miles of the A600 road. A Sonoma tree vole was reported inside unit B in 1994, and there are 9 spotted owl nesting territories within 1.3 miles of the THP area. Mendocino Redwood Company to log near Rockport, CA along the Mendocino coastline. This THP is about 7 miles north of Westport, CA and a mile east of Rockport, CA (unit A is adjacent to residents along Rockport Lane) and Highway 1 along the Mendocino coastline. 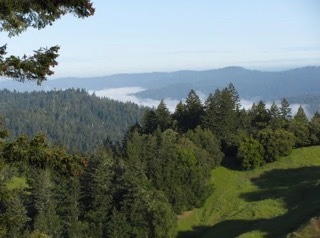 Mendocino Redwood Company is planning a tractor and cable logging operation on steep and unstable slopes in redwood and Douglas fir forests at an elevation of 10 to 1,240 feet. There are 37 landslide terrain sites in the THP area including 18 debris slides, 13 cut bank failures and multiple rockfalls, fill failures and steep head wall swales. Mendocino Redwood Company is planning to use ground based equipment on steep slopes over 65% grade, and/or on slopes over 50% grade with a high erosion hazard within units B, C and D. 36 road drainage sites are planned for work including rocking, dip construction, ditch cleaning, culvert repair/replacement and restoration of washed out crossings. There are 2 spotted owl nesting territories within .7 miles of the THP area. This THP is about 5 miles NE of Orick, CA and just east of Redwood National Park and Highway 101 at an elevation of 1,000 to 2,200 feet. 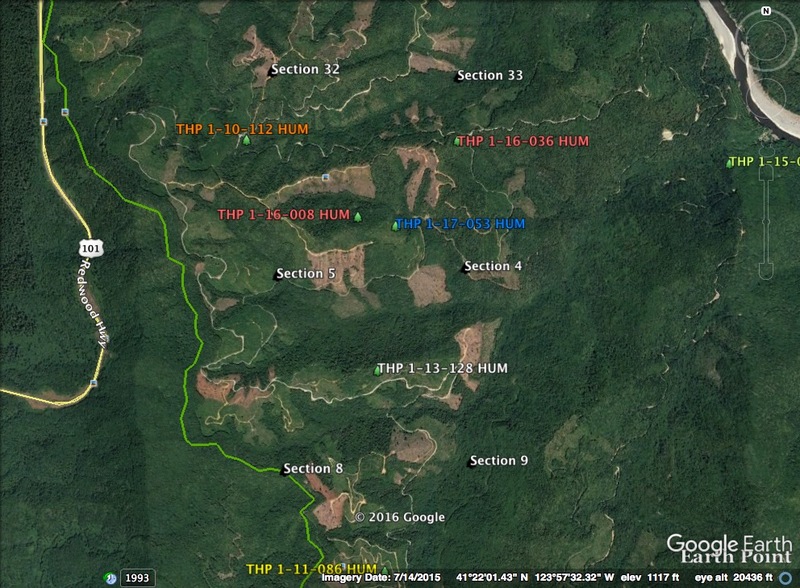 Green Diamond Resource Company is planning a mostly clearcut feller buncher, shovel and cable logging operation on steep and unstable slopes in redwood, Douglas fir, western hemlock and grand fir forests. The THP area flows into the Lower Klamath River Watershed which is listed as an impaired watershed for sediment, temperature, dissolved oxygen and nutrients. 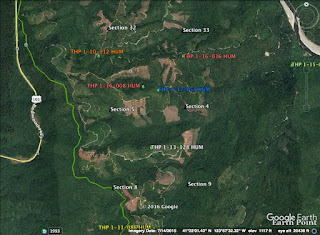 There are 6 landslide terrain sites in unit G, 3 landslide terrain sites in unit H, and 3 landslide terrain sites in unit I. 15 road drainage sites are planned for work including rocking, dip construction, ditch cleaning, and culvert repair/replacement. Tailed frogs are known to occur in or immediately adjacent to units G, H and J, and southern torrent salamanders are known to occur in or immediately adjacent to units F, G, H and J. There are bald eagle and osprey nests located along the Klamath River which is 1.5 miles east of the THP area, and marbled murrelet habitat is located .9 miles west of the THP area at Prairie Creek Redwoods State Park. Spotted owl nesting territories are located within .25 miles of units B and H, and within .5 miles of units A, G, I and and J. 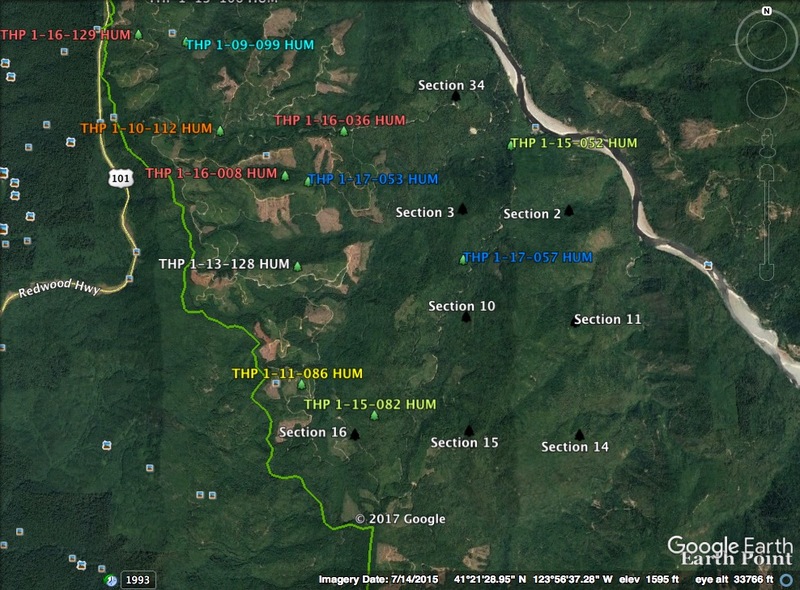 This THP is about 8.5 miles SW of Willits, CA and Highway 20 at an elevation of 320 to 960 feet. Mendocino Redwood Company is planning a tractor and cable logging operation on steep and unstable slopes in redwood and Douglas fir forests. The THP area flows into the East Branch of the North Fork of the Big River which is listed as an impaired watershed for sediment and temperature. There are 22 landslide terrain sites including earth flows, debris slides, disrupted ground, steep stream side slopes, steep inner gorges, swales, rock slides, and 16 road failure sites including fill failures, road gullying, bank sloughing, bank seeping, debris piling and cut bank failures. 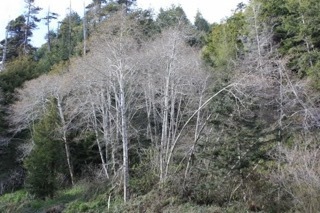 Mendocino Redwood Company is planning to use ground based equipment on existing skid trails in areas designated for cable logging, use 4 landings inside class I (year round) watercourses, and use ground based equipment on existing skid trails across unstable areas and on slopes over 50% grade with a high erosion hazard. They also are planning to construct a road within an unstable area, re-construct 200 feet of an existing seasonal road within a class II (mid sized) watercourse, and construct a road on steep slopes over 65% grade. 74 road drainage sites are planned for work including rocking, dip construction, ditch cleaning, culvert repair/replacement and restoration of washed out crossings. 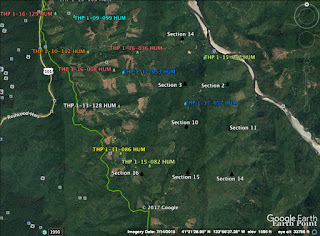 There are 5 spotted owl nesting territories within .7 miles of the THP area, and a large tree stand just south of the THP area that could contain marbled murrelet habitat.